The Mayfair Mall 18 theater is located in the Mayfair Mall shopping center. It was opened on May 14, 1999 as a General Cinema location (read article). A special feature of this new theater was the inclusion of two "Premium Cinema" screens that offered a full service restaurant adjoining the theaters and the auditoriums featured large leather seating. The Premium Cinema screens and restaurants were closed in 2000 amid financial woes experienced by General Cinema. 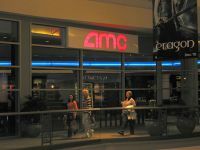 In December 2001, AMC announced that it would be purchasing the location. The theater now features 18 screens (the original Premium Cinema screens were re-opened as standard screens, but the seats were retained), and four screens are THX-certified. To attend this theater, you will need to enter Mayfair Mall and go upstairs. You will find the theater North of the center of the mall. A food court is located just West of the center of the mall, a short walk away from the theater entrance. Despite our numerous attempts to obtain that information, this theater does not indicate digital sound or THX designations on their showtimes. However, all screens are equipped with digital sound (we aren't sure of which system) and you can call the main office at 414-777-0467 to find out which movies are playing in the THX screens and the former Premium screens. An IMAX installation opened to the public on the weekend of October 17, 2009. This installation utilizes the new digital IMAX equipment, referred to by IMAX as the "multiplex design," which uses digital cinema projectors instead of the traditional (and very large) IMAX projectors that carry the equally-massive IMAX film. As a result, this theater can play IMAX 3D movies. According to an article by Duane Dudek of the Journal Sentinel on 10/15/2009, the screen measures 50' wide by 26.5' high. We published a Journal article on 10/19/2009 titled "AMC Mayfair Mall 18's IMAX Opens Early -- Does It Compete with the UltraScreens?" questioning how the new IMAX screen compares to traditional IMAX screens and to the large UltraScreen installations in some Marcus Theatres locations. Traditional IMAX screens can be as large as 72' wide and 53' high, so don't go to this theater expecting the same experience if you've attended one of those really big IMAX installations. For more information, please read "Is Your IMAX Theater Giving You the MAXimum Experience?" This IMAX installation was a conversion of one or more of the existing screens, but we do not have details about which of the previous screens were affected. As we can find out more information, we'll update this page. Mayfair Mall requires that those 17 and under be accompanied by a parent or supervising adult age 21 or older after 3 pm on Fridays and Saturdays. This information about Mayfair Mall's age policy is current as of January 4, 2010 and is subject to change without notice. Please reference the Mayfair Mall web site for the latest information about mall policies.